The Hindu sacred scriptures are The Vedas written from educated priests and kings about 1200 BCE to 100 B.C.E. 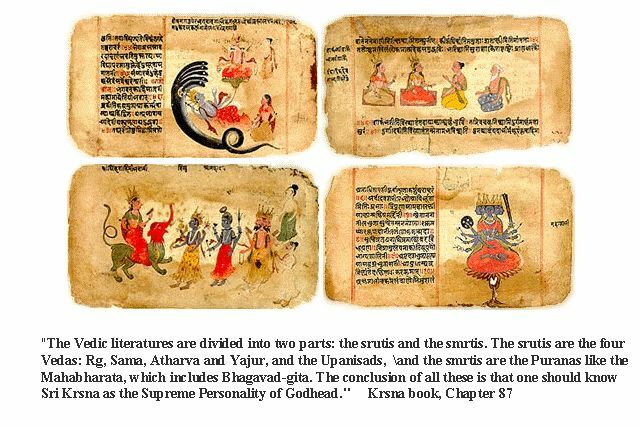 There are four Vedas scriptures: the Rig Veda, Sama Veda, Yajur Veda and Atharva Veda written in Sanskrit an Indo-European language. Scholars determined that Rig Veda, was written first out of the four Vedas scriptures praises in hymns. The Yajur Veda are ritual acts, that address to ritual instruments and offerings. Sama Veda are chants, in other words, melodies created by priest to call upon their gods. Atharva Veda is about worshiping the gods and perform sacrifices that make an important source on Hindu religion and sacred time. Each Veda has four sections Samhita which are invocation, Brahmanas is a section with rituals, Aranyaka is about treatises, and Upanishad a section about philosophical knowledge that contains beliefs and practices of yoga, meditation, karma and reincarnation. Krishna, a god, the god Krishna gives him support.